Leading retail chain, V-Mart Retail Ltd, has recently inaugurated its 49th & 50th value stores in Lucknow. Leading retail chain, V-Mart Retail Ltd, has recently inaugurated its 49th & 50th value stores in Lucknow, Uttar Pradesh. The Hussainganj store is spread over a retail area of 10,000 sq ft and Kesarbagh store is spread over a retail area of 5775 sq ft. Announcing the launch Mr. Lalit Agarwal, Chairman & Managing Director, V-Mart Retail Ltd. said, "I am really feeling proud on the opening of our 2 new stores in Lucknow. After getting a very good response from our existing stores in Uttar Pradesh, We have been planning to create a significant presence across the state". “We are proud to launch our unique fully air conditioned fashion store in Lucknow. We are getting overwhelming response in our existing stores from the people of Lucknow and it builds our confidence that we will get the same kind of response from our 2 new stores too. Providing customer's true value for their money has helped V-Mart to build the relationship with millions of families across the country". Besides, the opening of the store was focused wedding and winter. Also, the collection is timed well to serve the customers during this seasons. Further, V-Mart introduced heavy discount and offers to lure consumers. Moreover, people are confident that the opening of this new store in the city will give its citizens a chance to unique experience by offering a vast range of Fashion products, maintaining high standards in quality and design, offer affordable prices which will ensure that over time the store shall emerge as the destination of choice for bargain hunters. Besides, the retail chain offers its customers great shopping experience by offering a vast range of products under one roof providing customer's true value for their money. 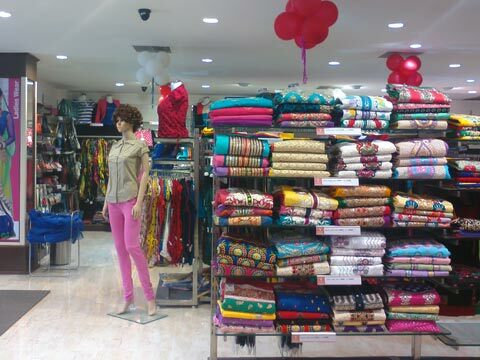 The New Store caters to the needs of entire family by offering fashion Apparels for Men, women and kids. The people in Lucknow are aware about high street fashion due to the high spread of Electronic Media and Communication. Families are looking for a convenience store, an organized retail store. Because of these reasons V-Mart has decided to expand to Lucknow.